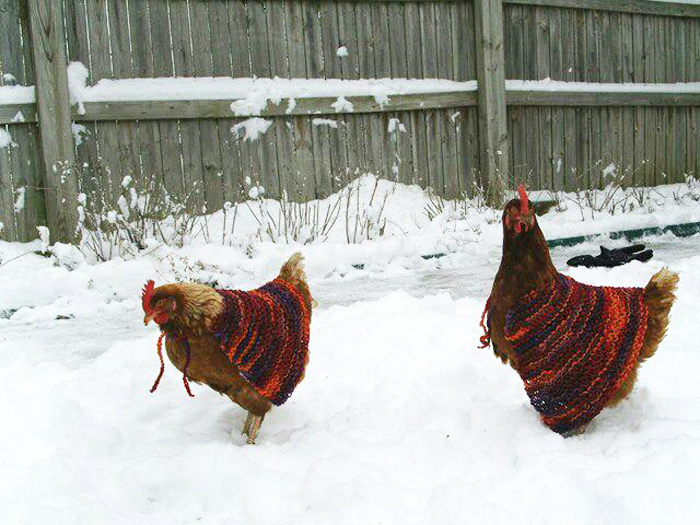 Some chickens are well suited for snowy environments. Photo by MaryEllen and Paul via Flickr. Shared under a CC BY-NC 2.0 license. Humans built the modern world with the help of domestic plants and animals. A byproduct of our many domestication experiments is a series of excellent long-term controlled evolutionary comparisons that are helping geneticists understand adaptation. In a study published in the May issue of G3, Fleming et al. identify genomic regions under natural selection in indigenous African and European chicken populations that optimize survival in these very different environments. Commercially raised chickens have been bred to thrive in the highly controlled environment of modern farms, but domesticated chickens have been living with humans in different regions across the globe for thousands of years. Heritage chicken breeds that are specific to certain geographic areas still carry the traits selected for in their ancestors that allow them to survive in harsher conditions. The authors of this study chose collections of such chickens from Northern Europe, where farm animals must endure cold and snow, and from Africa and the Middle East, where extremely high temperatures are the main obstacle for survival. After genotyping a large sample of African and European chickens at a selection of SNPs across the whole genome, they used patterns of variation to identify regions associated with the ability to survive stressful temperatures. They found large genomic regions on three different chromosomes that were significantly different between the two populations of chickens and looked at variation within the groups to identify genomic regions that appeared to be under selection. The authors found different genome regions were under selection in African and European chickens, showing that the basis of adaptation to these very different environments is genetically distinct. In African chickens, a large region on chromosome 27 stood out as significant in all analyses. This region includes several genes that have been previously implicated in heat stress responses in other animals. Some are linked to heart function and blood vessel formation, which may help these animals thrive in high temperatures. In Northern European chickens, significant regions were scattered across several chromosomes, with one large region on chromosome 2. One gene in this area has been shown to alter feathering patterns, suggesting that changes to the birds’ plumage might give them an advantage in the cold through improved ventilation or insulation. Additional candidate genes linked to insulin secretion and other metabolic activities suggest that energy regulation could promote the ability to tolerate cold. Though the birds in this study are not maintained commercially, understanding what makes them suited to their environments may have important implications for mainstream chicken farmers. Current commercial chickens are more susceptible to environmental stress than these distant relatives, and the threat of climate change means they may have to adapt quickly.